Gamers who pre-order Saints Row IV at GameStop will be eligible for the bonus Presidential Pack DLC. In past years Saints Row has embraced ridiculousness like a religion, presenting gamers with experiences that practically dare them to behave as crazy as humanly possible. No exception to that rule, Saints Row IV literally elects your character president and sets you to the task of saving the world from aliens with superpowers. Perhaps fearing that that somehow wasn't nuts enough, Deep Silver and Volition have announced new pre-order incentives that will give players the chance to play as presidents from real life. Gamers who pre-order Saints Row IV at GameStop or EB Games, and pickup their copy within 48 hours of its August 20th release date, will receive a token granting them access to the Presidential Pack DLC. "With this DLC you can live out your wildest dreams of being one of the most famous American Presidents or dress up your President like a real American Revolutionary," said Deep Silver in a newsletter. Supplies of the Presidential Pack will be limited so interested consumers will probably want to make sure they adhere to the aforementioned two day deadline . 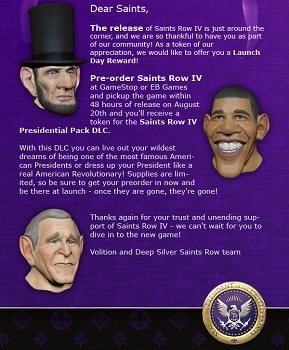 While Deep Silver doesn't mention any specific presidents by name, the newsletter announcing the pre-order bonus includes images of cartoonish versions of Abe Lincoln, Barack Obama and George W. Bush. We don't about know you, but we think it's a safe bet to say those three at least will be included in the Presidential Pack. We'll express some disappointment at the lack of a William Howard Taft avatar, but we'll just have to assume his mustache was too much for even Saints Row IV to handle.